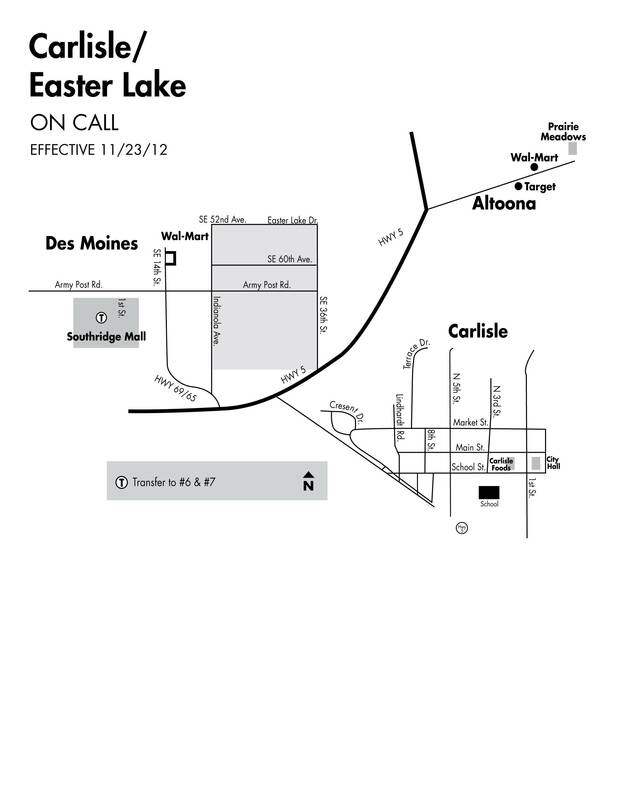 Service operates between Altoona, Des Moines (Southridge Mall and Wal-Mart) and Easter Lake. The shuttle will take you from a location close to your home or workplace to the nearest transit stop or other destinations within the service area. Thursdays and Fridays -- 8:30 a.m. to 3 p.m. Zone: The reservation-based neighborhood shuttle service provides transportation between Carlisle, areas of Des Moines including the Easter Lake area, Southridge Mall and the Wal-Mart on SE 14th Street in Des Moines, Altoona, and Runnells. Days and Hours of Operation: Thursdays and Fridays 8:30 a.m. to 3 p.m.